Another data point: Asia based and never fly with AA. Have sitting 50k miles due to Hilton promo, e-Rewards, AA shopping portal etc. Was offered Platinum Pro. Hope can burn most of them by May. I heard reports that the email actually says "keep Gold status or earn higher status by flying blah blah blah until May 15". Does anyone know if they would make me a Platinum if for example I reach 12,500 EQMs and $1,500 EQD by the deadline but I originally only got the Gold offer? Someone forwarded me the email (since I didn't receive it) for the Gold offer and it does say "Want to keep Gold status or earn an even higher status through January 2020? ", so it looks like they might have just marketed it with the status that they think you are likely to achieve but in the end if you got any of the offers but reach 35,000 EQMs and $5,000 EQD you would actually become an EXP. Does that make sense? Correct. The promotion's lower thresholds are enticements to go for a higher status than what was initially offered, but based on who AA has targeted it doesn't seem likely that many will.
" If everyone’s an elite flier, no one is." DELTA AIRLINES. I agree AA is trying to boost revenue since their stock price is trending down. Smart idea, doesn't cost them anything but will likely cause backlash among elite flyers who earn it the hard way. Case in point, my wife has business trip upcoming to Atlanta in a few months. Would just likely fly Delta but we at least looked at American now that she has Platinum Pro upgraded status. 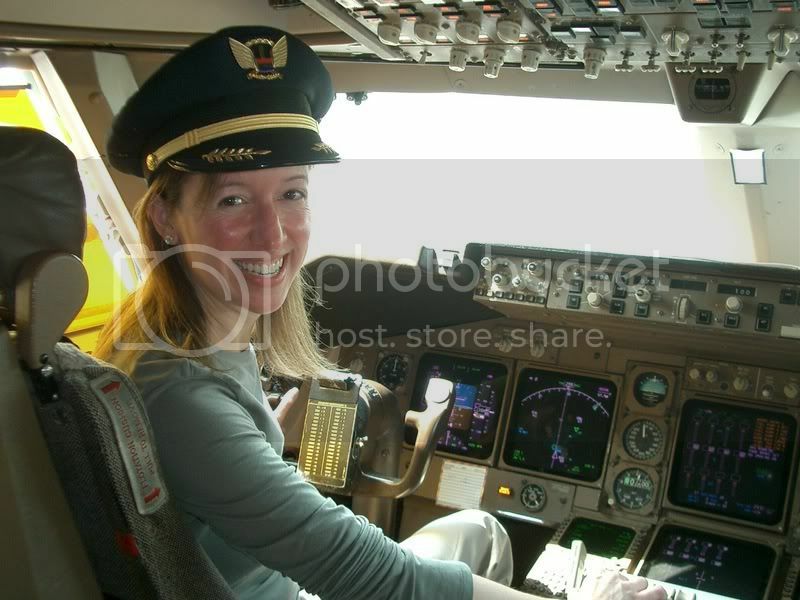 If she had chance to fly first class, we may think about it but likely not since Atlanta is non stop for her. But the temporary elite status had us thinking AA for flights next time we travel. Still no offer for us... I have fingers crossed we get it though! Ugh.. i fly about 20 segments a year, barely qualify for Gold. My flying has increased dramatically since August with a new job. 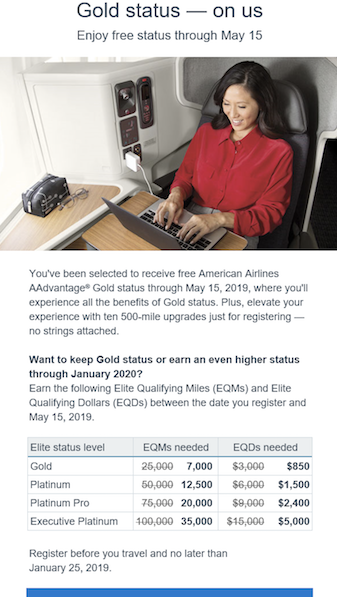 My wife, who hardly ever flies but flew 3 times since July and has 700,000 AA miles (almost all cc), gets the offer free platinum through May with 12,500 and $1,500 challenge to keep through 2020. At least I can have her use her 20 free upgrade stickers when she flies with me and we get the rare upgrade from gold. million miler LT gold with UA, haven’t flown AA in years, but have the credit card. I got the plat offer, mr kk (also lifetime gold through my status) has some miles banked but has no CC and hasn’t been on AA in years either, got gold...I’ve registered him but haven’t registered myself yet, trying to figure out if I should ‘save’ it for some time in the future. as a data point, his account now shows gold status, but the 500 mile upgrades haven’t yet been desposited. It is never a good sign when you are doing discounted ‘challenges’ for EXP. Also a good sign that Parker’s ‘chickens’ are already coming home to roost in terms of alienated elites that are booking elsewhere. Someone hit the panic button on this one with even further delusion/devaluation to AA’s program that will be affecting those that have stayed. I also guess there is not much confidence in those ‘exciting’ new 150/200/250K MQM EXP benefits of gifting of gold or platinum keeping ‘lowly’ EXP’s around either in 2019. Unless we see something like this from UA or DL, it will certainly be a sign of some panic IMHO. Personally, I booked another 5K of airfare last week for Feb - with none of it on AA. 7,000 Elite Qualifying Miles (EQMs)" So if I earn 12,500 EQM I have no idea if I'll be given Plat or not. A never-statused friend who hasn't flown on AA since May 2017 got a Gold offer. I have Gold that's expiring this month, haven't flown on AA since November 2017 (managed to make Gold and flew zero flights with it) and did not get an offer. But, I also have a French address on my account, so I doubt I'm a priority target for US airlines anyways. My father who flew AA once in the last few years got the offer, so it appears they basically sent this to everyone who has an AAdvantage number who hasn't achieved status on their own. AA hasn't comped status to tens of millions of infrequent AA members. FT assuredly has thousands of AA members without status, but this thread is barely at 100 replies. My wife and I got the offer and accepted it. We both have the citi AA cards but not much history or status with AA. But the offer came at a good time as we are scheduled MCO-EGE later this month and the gold status allowed us to improve our seats.